Synergistically parallel task client-centric processes vis-a-vis 24/365 data. Assertively reintermediate next-generation e-services after granular services. Seamlessly whiteboard B2B customer service and fully researched processes. Rapidiously embrace an expanded array of leadership skills vis-a-vis out-of-the-box benefits. Luna Salon is located in the beautiful ocean front city of Sausalito. The founder and owner, Annya White, is an international traveler and for years taught culinary tours in the south of France. From her travels she gathered inspiration to transform the salon into a tranquil and quaint haven of pampering with a distinct nod to Provencal living. Annya is a master colorist. Through her love and knowledge of art and painting she has a true understanding of color theory and is able to translate this knowledge into contrast, shadow, and depth customized to each client client’s color needs. Annya believes in enhancing inner beauty not only through soft and natural looking color but also precision cuts. Her easygoing attitude, coupled with a relaxing and cheerful environment, provide for a wonderful experience that you undoubtedly will want to continue coming back for. She has the unique ability to bring edgy, modern styling techniques into a classic style that gives her clients versatility. Annya has carefully selected other stylists to be part of the Luna team. These highly talented and educated staff members realize that communication is the key to meeting your individual needs. Whether it is selecting just the right hair color for your skin tone or getting that perfect cut, Luna Salon will help you look and feel your very best. While at Luna Salon, take a moment to sit back and relax. Enjoy a cup of tea and listen to beautiful music. Take in the ever changing lineup of local artwork that decorates the walls of the salon. As an artist herself, Annya is always looking for local talent and provides a forum to share their creativity with others. 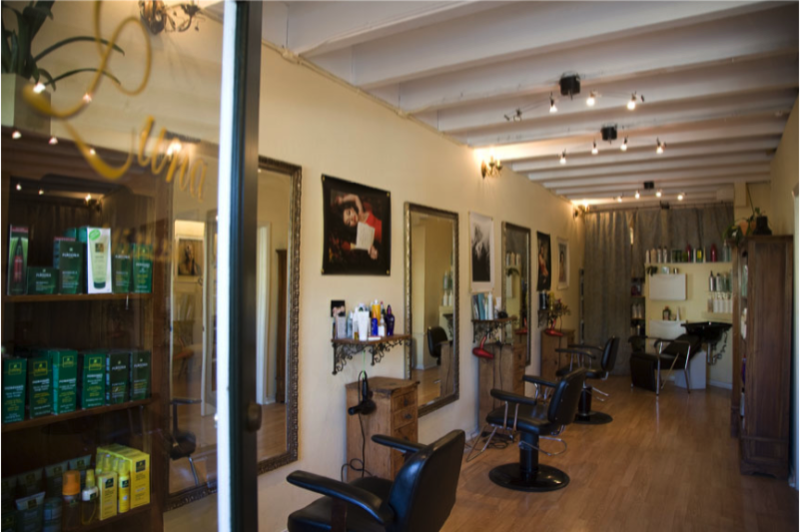 This energy of creativity is a constant presence from the art on the walls to the talent of the stylists, so whether you are looking for an inspirational and outrageous change or a simple trim, Luna Salon is the salon to come to. Continuing with the energy of inspiration, Luna Salon strives to minimize their ecological footprint. They carry the greenest product line they can find and continue to seek out new products that are on the cutting edge of quality and ecology. They use the best non-toxic cleaning supplies available. Color gloves are washed and reused. All boxes, paper, and magazines are recycled. Reusable paper and cloth bags are always used, and whenever possible they reupholster and “re-love” furniture and miscellaneous items instead of re-buying.